Four down-on-their-luck crooks -- Maddux (Ross Hagen), Kelly (Kelly Thordsen), Wilber (Hoke Howell) and A.J. (Eric Lidberg) -- drift from one small town to the next sticking up various businesses for chump change until Kelly and A.J. are caught and sent to a prison work farm. Maddux and Wilber bust them out with machine guns blazing, wasting half a dozen guards in the process, and the brainless crime spree is resumed. The four rob a bank while dressed in nun’s habits for no particular reason, then hop on motorcycles and take off across the desert for Mexico. After shooting it out with two state troopers, killing one and seriously wounding the other, they cross the border and blow all their loot on tequila and whores until the police arrive to take them in dead or alive. Originally titled FIVE MINUTES OF FREEDOM, this superficial crime tale co-written by actor-producer Hagen and director Ivan Nagy needed a lot of script polishing to bring characters and situations into focus. Threadbare storyline plays like BUTCH CASSIDY AND THE SUNDANCE KID meets THE WILD BUNCH, with motorcycles instead of horses and no comprehension of the themes of those films or what made them resonate with viewers. The comical tone established during the pre-credit intro vanishes the moment Thordsen and Lidberg's characters are incarcerated. Credit sequence, in which a black prisoner is harassed and killed by a sadistic redneck guard, might've been effective in another movie but comes across as just pointless in this one. 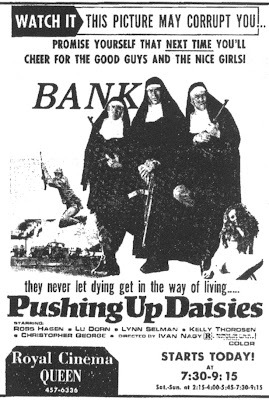 Having the crooks dress up as nuns to rob a bank likewise serves no purpose, except to provide an eye-catching graphic for the film's poster and ad slick (Pic was released by Cannon in 1973). At least two of the four protagonists appear to be war veterans -- Maddux at one point claims to be an ex-Green Beret -- but they can't cut it as civilians and are even worse as criminals. There's no place at home for their kind of training, yet even this idea is only hinted at and never explored. Performances are fine considering the thesps have not much to work with and the action scenes well handled, but the cheap, grungy, claustrophobic sets are a detriment (interiors were shot entirely at Studio One in Hollywood) and Michael Neyman's unattractive photography doesn't help. Christopher George, fifth billed in the newspaper ads, actually does an uncredited cameo as a gas station attendant who gets knocked unconscious and robbed by the gang. Biggest thrill offered is the sight of busy character actor Thordsen, who almost always played cops (and usually in silly live-action Disney movies), in a lead role as a shabby lawbreaker.